BEIJING (CNN)-- It was the day after China's National Day, and everyone who lives in the capital city apparently was out for a walk. The area around Tiananmen Square was packed. Many people carried China's national flag, heading to the square to examine the floats from the huge parade a day earlier. For my part, I wanted to see the Forbidden City. The last time I had visited was 10 years ago, following the crackdown in Tiananmen, when a handful of journalists were the only patrons of the palace grounds. This time, however, the imperial palace was a prime place to be. I stood in line nearly 45 minutes to get my ticket. Surveying the crowd ahead and behind me, I was sure that I had come too late in the day, and that the palace would be too thick with people for me to see anything. I was wrong. I had forgotten about the scale of the Forbidden City and the fact it was built to humble anyone who came inside those massive walls. 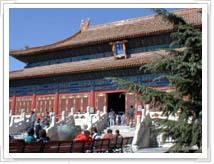 Starting in 1420, the Forbidden City was the home of 24 Chinese emperors during the Ming and Qing dynasties. It fell into decay after 1911, the year the Qing collapsed and China's Republican era began. The Chinese government has been working for decades to renovate the Forbidden City. The renovation reportedly was stepped-up in recent months, in advance of the 50th anniversary celebrations. The moat around the outer walls, for example, was dredged and cleaned. The Forbidden City is 720,000 square meters (nearly 2.6 million square feet, or more than half the size of Minnesota's Mall of America). On its grounds are more than 800 buildings. The walls surrounding the complex are more than 30 feet high. You enter through the Meridian or Wumen Gate, a high-sided, C-shaped structure that reinforces your sense of smallness. The gate has three doors, one of which the emperor alone was allowed to use. 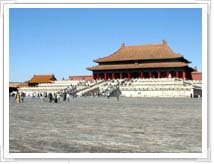 The Forbidden City is situated on a north-south axis. When I was there, visitors stayed mostly on the "Imperial Road," a raised wide walking space that connects each of the interior palaces. Walking north into the city takes you a step deeper into China's imperial mind. The squares inside the first two courts are simply huge -- large enough to hold 100,000 people, which was about the size of the Imperial Court. The halls have names underscoring the imperial concept that the emperors were the Sons of Heaven. The Hall of Supreme Harmony, the Hall of Preserving Harmony, the palaces of Heavenly Purity and Earthly Tranquility all suggest the importance given to China's imperial rulers in keeping the world balanced. In the Imperial Garden I spoke with an Australian tourist I had met in the ticket line. 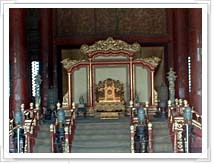 As we regarded the opulence, we talked about the fact that most of the emperors rarely if ever left the palace grounds. "I'm finding the whole thing a bit overwhelming," she said. "It's easier in some ways to concentrate on looking at the people." The people accompanying us into the Forbidden City did indeed bring the whole site into focus. PLA soldiers, retirees on holiday and overseas tourists flooded into the once-exclusive grounds. The sight of a little boy having a tantrum outside what had been a bedroom for the imperial concubines made me wish the old rulers could be brought back for a day -- just to see that the doors of their celestial playground had been thrown open to anyone who could afford the $U.S. 6.50 ticket. I wandered into one of the side courts and came to the Hall of Worshipping Ancestors that was used by the emperor for regular memorial rites. 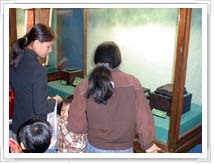 The hall is now the site of the "Exhibition of Gems of Cultural Relics." Wonderful bronzes, sculpture and jewelry competed for my attention, as did the hall's intricately carved wood interior. On the way out I decided to bypass the mobbed gates and halls in favor of an unobstructed side passageway. By doing so, I was able to avoid the crowds and stroll along red, high-walled, open-air corridors on my own. Considering I had walked all the way to the city's northernmost wall, I was not surprised at how long it took me to make my way back to the Meridian Gate. Once there, I was thankful I could keep going and leave the palace grounds -- as I stepped back out into the noise and relative chaos of Beijing on a beautiful autumn day.